It's tough being part of the news media. The hours are long, the pay is sometimes low and it seems as though no matter which story idea you pursue, there's someone ready to criticize your work. Politicians routinely accuse reporters of liberal media bias and college students are even trying to ban reporters from campus. Reporters are usually not allowed to defend themselves on the airwaves or in the pages of a newspaper. So, critics' claims go unanswered. 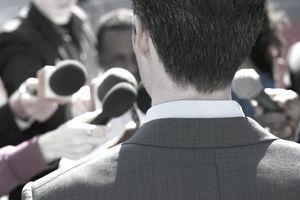 Reporters who get the opportunity to defend themselves and their work should remind people of these 5 reasons the news media play a critical role in society. The authors of the U.S. Constitution thought enough of the news media to guarantee the freedom of the press in the First Amendment. Someone attacking the press is attacking the very foundation of our country. In those days, the press was made up of people using a quill to document the actions of other people. These days, some people consider radio shock jock Howard Stern, talk show host Jerry Springer or the women of ABC's The View as part of the news media, alongside the team on 60 Minutes or the reporters at The Washington Post. When critics lump everyone together in the same stew pot, that's a recipe for trouble. Someone like Fox News Channel commentator Sean Hannity has a very different role in news media than CBS News anchor Scott Pelley. The Constitution protects them both, but critics should acknowledge that opinion and factual reporting both have a place, as long as opinionated journalism is clearly labeled. Viewers and readers expect journalists to hold the powerful accountable, whether it's the president of the U.S., the mayor of a town or a local police department. One reason investigative reporting is so popular is that people want to make sure those in authority aren't abusing their position. When a reporter uses tough questions to get at the truth, the person who's being cornered typically retaliates by accusing the reporting of being unfair or biased. That's a lot easier than simply being candid in answering what's being asked. If reporters simply stopped trying to make sure the people we elect, hire or appoint to positions of power are doing a good job, then there's little in the way of checks and balances system to protect the public's interest. If it weren't for the dogged reporting by The Washington Post, President Richard Nixon would've escaped the Watergate scandal because no one would've known about it. Let's not forget the most basic role of news media. That is, to tell people what's happening in their community. Critics who say the news media can't be trusted often ignore the fact that without news media, people wouldn't know about the traffic jam on the way to work, the chance for rain in the forecast or what's being built on a street corner downtown. Information is the currency that keeps communities running smoothly. Besides offering information, many news media outlets make community involvement a cornerstone of their business. A charity that has a TV station's news anchors helping to raise awareness and money for its cause can immediately see the benefits of news media. While that's not a traditional role for a journalist, most media pros feel a sense of responsibility to not just report the news, but to do something to make their community better. Critics like to blast the news media for offering too much "breaking news" that appears to be nothing more than a branding tool, but when a crisis hits, news media outlets can be a lifeline. Accurate information saves lives, and there's no one better than a trained media professional to deliver it. Whether it's a tornado or the 9/11 terrorist attacks, media pros know how to stay calm, get the facts and present information responsibly. True, social media has played a larger role in emergencies, but much of that information is rumor, propaganda, or just plain wrong. While media pros don't get every fact correct in the immediate aftermath of a disaster, they know which questions to ask of emergency first responders and can relay that information quickly to the public. Rarely do they ever get credit for their work in keeping people safe and informed. Politicians may not like to admit it, but they routinely watch or read news stories to find out what the voters are saying. It's the news media which give a voice to the masses. People in a city may complain about a dangerous intersection. A TV station does a story with interviews from people who live or work nearby describing the problem. The mayor watches the news, is convinced that the issue is important and puts up a new traffic light. That's a simple example, but had it not been for the news story featuring ordinary people describing the problem, the traffic light wouldn't have gone up. Again, social media outlets allow people to discuss issues like this, but it is tough for them to get the same exposure as the 6 o'clock news on TV.